(Nanowerk News) The compound eyes found in insects and some sea creatures are marvels of evolution. There, thousands of lenses work together to provide sophisticated information without the need for a sophisticated brain. Human artifice can only begin to approximate these naturally self-assembled structures, and, even then, they require painstaking manufacturing techniques. Now, engineers and physicists at the University of Pennsylvania have shown how liquid crystals can be employed to create compound lenses similar to those found in nature. Taking advantage of the geometry in which these liquid crystals like to arrange themselves, the researchers are able to grow compound lenses with controllable sizes. An array of microlenses self-assemble around a central pillar. These lenses produce sets of images with different focal lengths, a property that could be used for three-dimensional imaging. They are also sensitive to the polarization of light, one of the qualities that are thought to help bees navigate their environments. The study was led by Francesca Serra and Mohamed Amine Gharbi, postdoctoral researchers in the Department of Physics and Astronomy in Penn's School of Arts and Sciences, along with Kathleen Stebe, the School of Engineering and Applied Science's deputy dean for research and a professor in Chemical and Biomolecular Engineering; Randall Kamien, professor in Physics and Astronomy; and Shu Yang, professor in Engineering's departments of Materials Science and Engineering and Chemical and Biomolecular Engineering. Yimin Luo, Iris Liu and Nathan Bade, members of Stebe's lab, also contributed to the study. It was published in Advanced Optical Materials ("Curvature-Driven, One-Step Assembly of Reconfigurable Smectic Liquid Crystal “Compound Eye” Lenses"). Previous work by the group had shown how smectic liquid crystal, a transparent, soap-like class of the material, naturally self-assembled into flower-like structures when placed around a central silica bead. Each "petal" of these flowers is a "focal conic domain," a structure that other researchers had shown could be used as a simple lens. "Given the liquid crystal flower's outward similarity to a compound lens, we were curious about its optical properties," said Gharbi. "Our first question," Serra said, "was what kind of lens is this? Is it an array of individual microlenses, or does it essentially act as one big lens? Both types exist in nature." To make the lenses, the researchers used photolithography to fashion a sheet of micropillars, then spread the liquid crystal on the sheet. At room temperature, the liquid crystal adheres to the top edges of the posts, transmitting an elastic energy cue that causes the crystal's focal conic domains to line up in concentric circles around the posts. 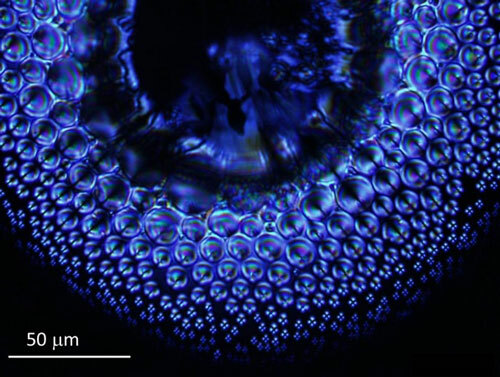 With these liquid crystal lenses so easy to make, the experiment to test their properties was also relatively simple. Finding a suitable compound lens under a microscope, the researchers put a test image, a glass slide with the letter "P" drawn on in marker, between it and the microscope's light source. Starting with the post in focus, they moved the microscope's objective up and down until they could see an image form. "If the array worked as a single lens," Serra said, "a single virtual image would appear below the sample. But because they work as separate microlenses, I saw multiple P's, one in each of the lenses." Because the focal conic domains vary in size, with the largest ones closest to the pillars and descending in size from there, the focal lengths for each ring of the microlenses is different. As the researchers moved the microscope objective up, the images of the P's came into focus in sequence, from the outside layers inward. "That they focus on different planes is what allows for 3-D image reconstruction," Yang said. "You can use that information to see how far away the object you're seeing is." A second experiment also showed this parallax effect. Replacing the P with two test images, a cross with a square suspended several inches above it, the researchers showed that the cross intersected the square at different points in different lenses. This phenomenon would allow the reconstruction of the square and the cross's spatial relationship. A third experiment showed that the team's lenses were sensitive to light polarization, a trait that had not been demonstrated in liquid crystal lenses before. Bees are thought to use this information to better identify flowers by seeing how light waves align as they bounce off their petals. By putting another image, a smiley face, above the microscope's lamp and a polarizing filter on top, the researchers were able to block the images from forming in some lenses but not others. "For example," Serra said, "the lenses on the right and left of the pillar will show images just for vertically polarized light. This sensitivity results from the peculiar geometrical arrangement of these liquid crystal defects, which other artificial compound eyes or microlens arrays lack." Answering fundamental questions about how these microlenses work extends this area of research in the direction of practical applications. With an understanding on the geometric relationships between the size of the pillars, the arrangement of the focal conic domains and the focal lengths of the microlenses they produce, the team has shown how to grow these compound lenses to order. "Last time we had tiny flowers. Now they are 10 times bigger," Stebe said. "That's important because it shows that the system scales; if we ever wanted to mass-produce these lenses, we can use the same technique on arbitrarily large surfaces. We know how to put the pillars in any given position and size, how to cast out thin films of smectic liquid crystal and exactly where and how the lenses form based on this geometric seed."